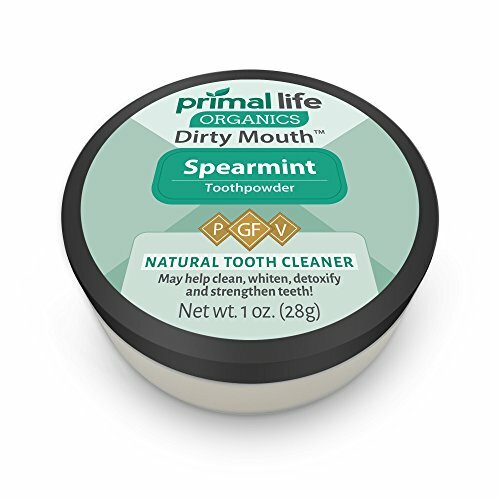 Our Dirty Mouth™ Tooth powder fills your mouth with vital and trace minerals important to maintain dental health the natural, Paleo way. This mildly abrasive toothpowder gently polishes, detoxifies and refreshes your teeth while also helping to re-mineralize and strengthen the teeth. You see, teeth are living, porous parts of your body. And throughout your life, foods, commercial toothpaste, medications and chemicals (food preservatives) can leech the minerals from the teeth causing your enamel to weaken and become more susceptible to decay and breakdown. The result? More sensitivity, more pain, and more risk of tooth decay and infection. But with our Dirty Mouth™ Toothpowder, you’ll get a refreshing cleansing agent that’s made from a premium blend of three earthen clays, baking soda (aluminum free), and essential oils—yet still tastes great! Ready to take back control of your dental health? Click the Add to Cart button now to get your supply of Dirty Mouth Boost for the whole family! This WILL NOT taste like commercial, sweetened toothpaste. There are NO sweeteners in this Toothpowder. It may take two or three uses to adapt to the taste. ★ GENTLY POLISHES, DETOXIFIES AND REFRESHES ★ while also helping to re-mineralize and strengthen the teeth. ★ REFRESHING CLEANSING AGENT ★ made from a premium blend of three earthen clays, baking soda (aluminum free), and essential oils-yet still tastes great! Non-GMO, GMO Free, No flouride, SLS, Soy, Corn or additives. If you have any questions about this product by Primal Life Organics, contact us by completing and submitting the form below. If you are looking for a specif part number, please include it with your message. Imako Cosmetic Teeth 2 Pack. (Large, Natural) Uppers Only- Arrives Flat. Fit at Home Do it Yourself Smile Makeover!